The English language can be difficult to grasp with all of its little exceptions and strange pronunciations. Practice by memorization and pictures with this Magic E Fold and Read: Long A! This resource from Only Passionate Curiosity is perfect for young learners struggling to read the changes that the “magic e” makes in words. 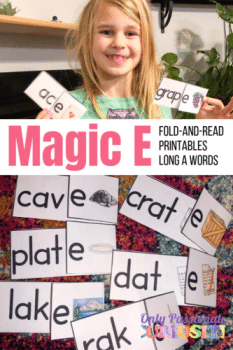 All words in this activity focus on how the ‘a’ changes from a short sound to a long sound when the “magic e” has been added! Get the Magic E Fold and Read: Long A here!